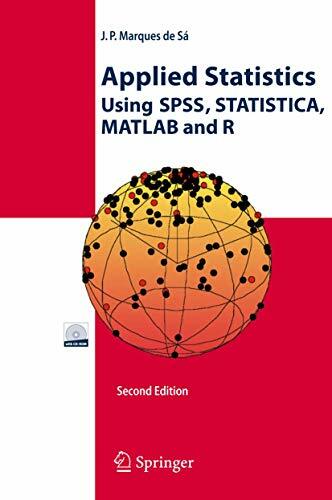 [PDF] Applied Statistics Using SPSS, STATISTICA, MATLAB and R | Free eBooks Download - EBOOKEE! Description: This practical reference provides a comprehensive introduction and tutorial on the main statistical analysis topics, demonstrating their solution with the most common software package. Intended for anyone needing to apply statistical analysis to a large variety of science and enigineering problems, the book explains and shows how to use SPSS, MATLAB, STATISTICA and R for analysis such as data description, statistical inference, classification and regression, factor analysis, survival data and directional statistics. It concisely explains key concepts and methods, illustrated by practical examples using real data, and includes a CD-ROM with software tools and data sets. Readers learn which software tools to apply and gain insights into the comparative capabilities of the primary software packages. Major improvements of the second edition are the inclusion of the R language, a new section on bootstrap estimation methods and an improved treatment of tree classifiers as well as extra examples and exercises. No comments for "[PDF] Applied Statistics Using SPSS, STATISTICA, MATLAB and R".